My Monday was great because I got to knit with my Skanks! I have missed them so much. I managed to show restraint and not go about creating an uncomfortable situation by hugging everyone. It had been way too long. I am out of the running to become Supreme Sock Madness Champion. It seems like it was a rough round. Several knitters seemed so tired at the start of the round and ready to admit defeat just after the pattern release. For a minute, I thought that might give me a chance to make it through, but the three spots in the Tennessee Twisted Knitters division filled up quickly. Go, TTK! I do have one completed sock to show for my effort. I think that there might be a couple of problems with the pattern, but my brain was fried. I might try to tackle it later. My Icarus is coming along, but not quickly. If I do not have the right rhythm, the rows drag by and I only complete one or two. Otherwise, I can complete a chart repeat. Still, the rows are getting longer, so it makes sense that they are not sailing along. In interesting news, my shawl has an admirer who inquired if it might be for her. The color changes of this yarn still entertain me. Everything turned out fine with the daughter. It was just one of those unlucky things for her. The upside to the situation is it inspired her to register for classes. I figured out yesterday that I owe an H post for the abc-along. I thought I had another week. I will try to get it done soon. I have made a mad dash through my backlogged blog reading. This means I did not make too many comments. Sorry! I do not want to make grand announcements about how I am going to do things differently. However, I have noticed some areas that are in need of improvement and within my ability to change. The medical drama is a continuing saga without many answers and several frustrations. We will not get into it for now, lest this post require a Rantdom Wednesday title. We shall just say that so far, everyone is fine. Anyway, times of concern and waiting can equal excellent knitting. I did not accomplish much at the hospital, but at home, it was another story. I just kept knitting. I love this pattern. The cables and lace are beautiful, quick, and fun to knit. I was unsure about the afterthought heel, but when I finished the first and tried it on I was sold. Anyway, I knit all night long, and before my husband was up the next morning, I had a new pair of socks and a spot in the competition for round five of Sock Madness. 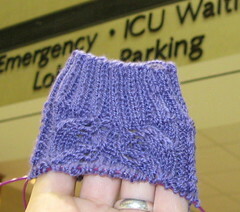 The next pattern release is Sunday morning and it will have a Japanese short-row heel. Only the first three finishers in each division will advance to round six. My Icarus restart is a success. The Jojoland Harmony is much nicer to work with, and the slow color changes are entertaining to me. Nora asked for more photos, and I am not one to turn down such a request. You see my experiment with the blue. It looks nice, but it just was not right. I am more pleased with the new one. I neglected to mention that I made it through the third round of Sock Madness. Arrival of the fourth pattern could happen at any moment. I was knocked out of the competition last year in round three, so I have already made it further this time. This is about the only kind of deadline knitting that I have been able to enjoy. We will see how this goes. I just got off the phone. One of the kids is not feeling well, so we may have waiting room time ahead of us today. I was called upon for my knowledge of the location of the appendix. I hope it is just gas. I've been sick with the crud. The good news is that I have finally gotten some sleep. The bad news is that my sleep is at odd hours and I am still missing out on life. Actually, that is fine, because I have not been up for much else. I finished my experimental Icarus. I had intended to do more, but I accidentally pulled the needle out and then decided to be done with it. The yarn is not right for this project, but then I remembered the other yarn I had in mind for it. I have never knit with Jojoland Harmony before, but think it will work out nicely. Take time to save time; check gauge. This week has wiped me out. I think the fact that I celebrated four consecutive hours of sleep today as an accomplishment has something to do with the way I feel. I nearly burst into tears when I could not join the Skanky Knitters on their Yarn Harlot adventure yesterday. You can see Jaspher and his first pair of socks over there. I got just the boost I needed today when we went to the Cracker Barrel for supper. I was a bit dizzy and in a haze when I caught familiar faces. Since there were two empty chairs at their table, and because they are so fabulously nice, Christina and her family invited us to sit with them. I think that this is what gave me the boost to be able to begin the latest round of Sock Madness. This is the infamous laceweight round which has been the subject of much fear and speculation for many participants. I decided to bring another Skank along with me (I miss them so much) by using some yarn that Laura gave me. You can see my progress atop my experimental Icarus. That rumpled mess is all the knitting I have been able to accomplish this week. Yeah. 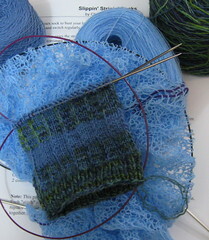 Anyway, I am hoping for sleep tonight, but if it stays away, maybe I can make progress on Sock Madness socks. It does not look great for either. Sock Madness is between rounds. My EPS FIYC is coming along nicely. It is wonderful, whenever knitting. Still, I need something else to knit. I keep missing opportunities to knit with my friends. I need lace. It has been nearly a month since I have had lace on the needles. Then I saw a nice lace-along that interested me. While I am not giving up on getting together with my Skanks, I am pleased to have the chance to knit along with online friends. I am going straight for Icarus. There are two reasons I chose this pattern over Forest Canopy and Flower Basket--I have wanted to knit Icarus since I first saw it but never got around to it, and it is the only one of the patterns I already own. So now must dig through to the magazine so I can make my working copy of the pattern. That is more of an ordeal than it should be, but I am continuing to work on this issue. Anyway, I have some pretty, blue, laceweight, mystery yarn picked out. I may add beads, but I have not thought that far ahead. I had a hard time getting my Monday going. I thought about getting up more than once, but I never made it. I finally gave a big effort so that I might make it out to knit with the Skanks. I checked the email and discovered that I had been gotten. It was a pre-April Fool's Day surprise from Sock Madness in the form of an early release of the pattern for round two. I was over eight hours behind. I grabbed some yarn and then had a few moments of panic when I could not remember the great place I had stowed the sock needle stash. I cast on and got going, and never made it out to knit with everyone. In truth, I was not quite up for getting out, but I do miss being with them. I hope I can make it next Monday. Anyway, Tuesday ended up being topsy-turvy, too. I really needed a couple of thirty-minute naps, but I only managed one. I was unsure about the sock pattern at first, but before long, I knew it was a good one. It has a different stretchiness so that it can accommodate different foot shapes. My choice of yarn (Lang Jawoll Superwash) obscures the patterning, but I liked what I was getting. As I knit along, I thought that these might be good for my husband. Then he saw and admired them, and I knew they would be for him. He thought the yarn I was using was the stuff I had bought for him. Guess I should knit that pair soon, too. Anyway, I made pretty good time knitting these socks. 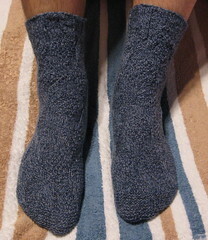 I think it is so neat that these are reversible socks. Another reason they are good for the hubby. My actual knitting time was about 22 hours, but I took breaks and kept up with life as best as I could. Knitting the toes took forever, and by the time I was working that portion of the second sock, I was more than ready to be done. On breaks between those last few rounds, I changed the way I was moving my fingers with a typing test Norma shared the other day. 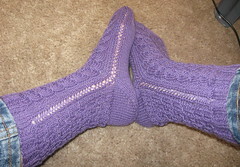 It was with much relief that I scared my husband out of a restless sleep to put on a completed pair of socks so I could take the picture and upload it to the flickr group. This was another fun pattern. Our Sock Madness hostesses picked another winner.